2014 was another very good year for the beer scene in Columbia as well as the rest of South Carolina. Local breweries are an essential component of a lively beer culture, and during the year two more production breweries opened in the Columbia area and a fourth one is scheduled to begin brewing later this year. Several new breweries also opened during the year in the Upstate and in Charleston and Florence. Conquest Brewing Co. (947 S. Stadium Road) was the first of the three breweries and the smallest in brewing capacity. 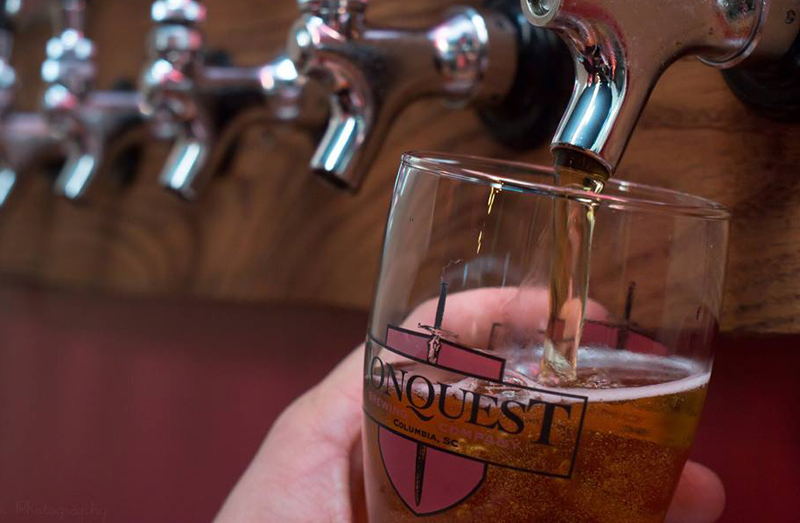 Conquest takes advantage of its small size by experimenting with new recipes and brewing small batches of interesting new and different beers for sale in its tasting room. During the year, Conquest added brewing equipment, expanded its tasting room and is now bottling its core brands Sacred Heart, Medusa and Artemis Blonde in 22-oz bomber bottles. River Rat Brewery (1231 Shop Road) was founded by Mike Tourville. River Rat is in full production, and its tasty beers are very popular in the Columbia area. River Rat has a beautiful facility with spacious grounds for a beer garden and a comfortable tasting room. The brewery is now bottling its popular Broad River Red, American Kölsch and other fine beers in 12-oz bottles. Swamp Cabbage Brewing Co. (801 Brookwood Drive) was founded by brothers Doug and Ed Boyd and has the largest brewing capacity of any of the local breweries. 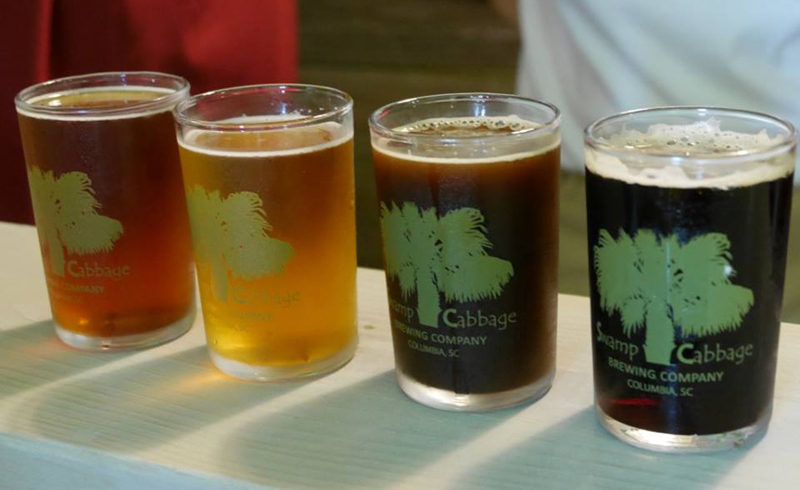 Swamp Cabbage is draft-only for now but plans to bottle in the future. All of its beers are on tap in its tasting room, including its most popular, an English-style ESB. 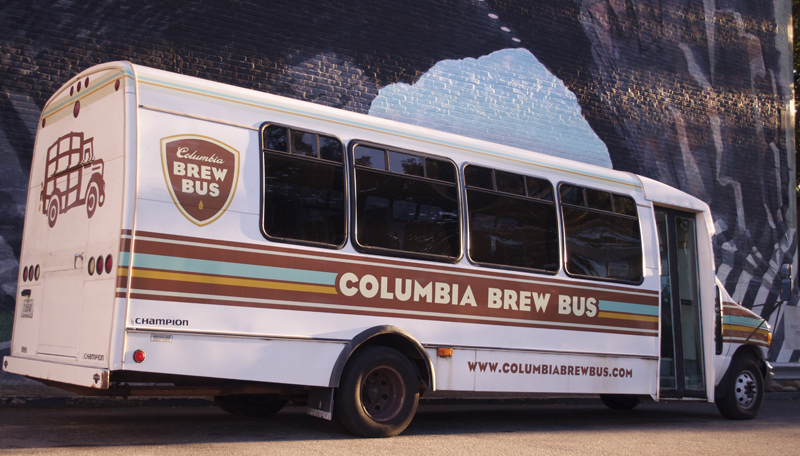 A new and welcome addition to the local beer scene is the Columbia Brew Bus. This company offers beer enthusiasts tours of Columbia’s brewery district in a comfortable bus with stops at each of the breweries for tours and tastings of their beers. Retail bottle shops are a vital part of Columbia’s beer scene and have thrived as more and more beer drinkers have become beer enthusiasts. The statewide popularity of beer has prompted wholesale distributors to bring more and more world-class beer to South Carolina. Columbians now have access to a sometimes bewildering variety of outstanding beer in addition to the local brews. In addition to packaged beer, most beer retailers have installed growler stations in their stores. These are similar to a draft station in a bar. In a retail shop, however, attendants fill growlers with draft beer for home use. The growlers are refillable and environmentally friendly, but the principal advantage is the unmistakable freshness that only draft beer delivers. Growler sales continue to be extraordinary as more and more people experience the brewery-fresh taste of fine beer in a growler. Green’s Beverage Warehouse (4012 Fernandina Road) is the largest beer retailer. The store stocks an astonishing array of almost every beer style from obscure Belgian ales to the most exotic barrel-aged beers and everything in between. Green’s displays most of its rare beers in a cool room that was formerly used for the most expensive wines. Green’s offers weekly tastings on Thursday and Friday afternoons from its 24-tap growler station to introduce new beers. Morganelli’s (3155 Forest Drive) is an established and respected retailer in Forest Acres. Morganelli’s has a knowledgeable and well-trained staff of beer enthusiasts, and the store is stocked with a carefully selected inventory of outstanding beers from all over the world and the state. Morganelli’s recently upgraded its popular growler station, and the friendly staff provides outstanding customer service—a hallmark of this family-owned business. Total Wine (275-C Harbison Blvd.) has settled into a beautiful new space that is adjacent to its former location. The beer section and the growler station have been expanded and are loaded with fine beer. Sam’s Fine Wines (5050 Sunset Blvd.) brings fine beer to the growing Lexington area. Sam’s features weekly tastings of new beers. 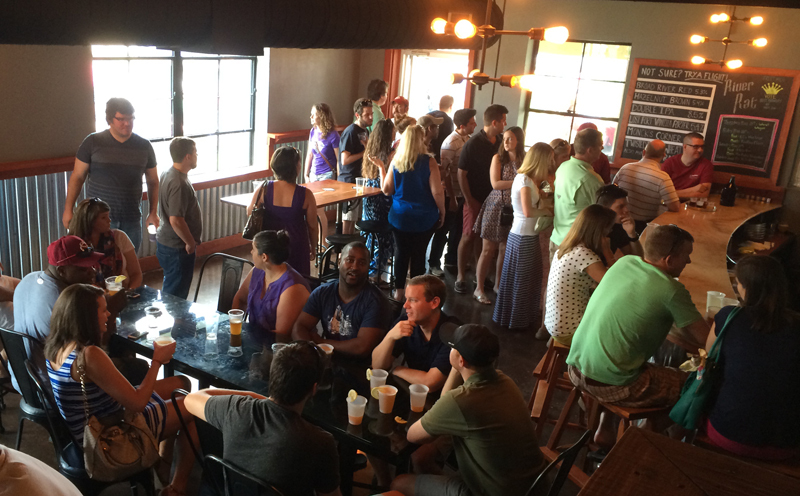 Craft and Draft is a new venture in the popular Shandon neighborhood. The shop at 2706 Devine St. is part retail beer store and part neighborhood bar. Craft and Draft is part of a new trend for retailers with both on-premises and off- premises licenses. The store is the brainchild of Andrew Johnson and Kellan Monroe. Andrew says that their niche is local beers, and they stock plenty of fresh local beer for retail sale and on tap among their 31 taps. Doug Aylard’s Vino Garage is doing well at 2327 North Main St., three blocks from Elmwood Avenue. Doug is in the process of adding a bar with six draft taps, including a tap for wine, plus seating inside and outside. Vino Garage will soon be a neighborhood bar as well as retail store with an ample selection of fine beer along with an excellent wine selection. This growth in the retail market in Columbia has strengthening the bar business for fine beer. For an evening of beer hunting, the Vista area of Columbia is the undisputed place to go. Carolina Ale House (708 Lady Street) is a terrific place to stop on a pub crawl in the Vista. CAH has an extensive selection of beer in bottles and on draft that works well with its full menu of tasty food choices, including appetizers, burgers, steaks and delicious entrées. In mild weather, the second-floor patio is a great spot for enjoying a beer with live music. The Flying Saucer Draught Emporium (931 Senate St.) has 81 taps of draft beer and plenty of bottles, as well as tasty sandwiches, brats and pizzas. Each week the Saucer features different promotions, including a Brewery Nite (spotlighting a specific brewery) and a Rare Keg Nite (featuring a fresh keg of a limited-release beer from a brewery). World of Beer (902 Gervais St.) is another impressive beer bar with 70 taps of draft beer along with hundreds of bottled beers. World of Beer has limited onsite food service, but its primary emphasis remains fine beer. World of Beer features monthly featured beers, weekly promotions and live music on weekends. This is a very special beer venue with its comfortable setting and a well-trained staff that knows beer and is ready to guide you through its extensive beer selection. Liberty Taproom & Grill (828 Gervais St.) has a total of 62 taps and features three beers on tap that are made by an affiliated brewery in Myrtle Beach as well as a wide selection of American and Belgian beers. Liberty is a great place to eat and enjoy a pint or two in its restaurant or in its spacious bar. The Mellow Mushroom (1009 Gervais St.) has made a serious commitment to good beer and has 29 taps of excellent beer and over 200 bottles of beer, along with delicious pizzas. The Whig (1200 Main St.) is a local favorite and combines outstanding food with a rotating selection of beer on draft and in bottles. The Whig’s Tuesday Taco Night is popular with regulars and soon-to-be regulars. Columbia’s only brewpub is Hunter-Gatherer Brewery & Ale House (900 Main St.). Hunter-Gatherer brews excellent beer generally in the English style. Hunter-Gatherer is the place to meet with friends and enjoy a pint of reliable beer in an eclectic setting with an interesting variety of tasty food. Kevin Varner of H-G is planning to open the fourth production brewery in Columbia later this year. The Lexington area now has a brewpub, the Old Mill Brewpub at 711 E. Main St. Brewer Matt Rogers is brewing fine beer for the Lexington community. In the Harbison area, The British Bulldog Pub (1220 Bower Parkway) is a great spot for beer from its 30 taps, along with an excellent selection of bottles in an atmosphere reminiscent of an English country pub. Tasty English-style pub fare is available, and soccer is often on the televisions. Another good place for beer in the Harbison area is the Carolina Ale House (277 Columbiana Blvd. ), which has 30 draft taps, an extensive bottle selection, delicious food, a fun atmosphere and loads of televisions. The Kraken Gastropub (2910 Rosewood Drive) is a popular venue for fine beer and exceptional food in the Rosewood area. The Kraken has 30 taps and includes a number of breweries from the Southeast. Nearby in Five Points, the venerable Publick House (2307 Devine St.) is a great place for a pint of beer in a neighborhood bar setting, and Delaney’s Music Pub & Eatery (741 Saluda Ave.) features live music, food and good beer. Down the street from Delaney’s is their sister bar, Speakeasy, who has hand’s down the best beer selection in 5 points. Hickory Tavern is brand new and adjacent to convention center on Senant Street. Over 100 beers and great food! Ya’ll check it out!